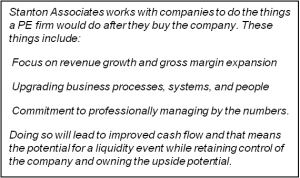 When business owners decide to turn many years of hard-earned success into a liquidity event it is almost inevitable that the discussions with their advisors will be about an “exit”: i.e., a sale of the company. However, there is a little-known alternative that may be a lot more attractive. And that is to have a liquidity event via what is called a “dividend recapitalization”; this results in the owner still having ownership of the company. If the owner of the company wants to retire and there is not a good management succession plan, it may well make best sense to sell the company. However, if the owner wants to continue to run the company and the company has significant growth opportunities, a dividend recap would allow the owners to cash out some of their equity and still participate in a sale down the road. Dividend recaps can also work well where some of the shareholders want to retain ownership of the company while others want to cash out. So, the owner has a liquidity event of $15 million and he still owns the company. (Also, the owner could keep some or all of the debt in the company to fund accelerated growth.) The owner can continue to grow the value of his company via making the changes a PE firm would make if they bought it. The company can then be sold some years later. This is a “second bite of the apple”, but one where the owner still owns the apple. Making the changes a PE firm would make: This is an important point. Apart from it making obvious sense to grow the value of the company, the company actually does have to be managed differently from how most family-owned businesses typically are. Having $15 million of debt on the balance sheet not only means there is now interest expense to be paid, but the credit agreement with the lender is going to have various financial covenants in it. These may include: minimum EBITDA; fixed charge ratio; interest coverage ratio, and other covenants. There now has to be a lot of financial discipline in how the company is run. 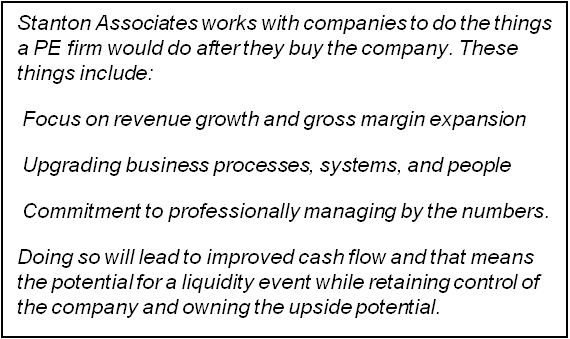 This means a singular focus on cash flow, including having reliable forecasts (which in turn requires reliable sales forecasts), managing working capital closely, making business decisions that maximize EBITDA, and much less of a focus on doing things to reduce taxes. The good news is that this new approach, with a myriad of other value creation strategies available, do much more than ensure compliance with the credit agreement: they also prepare the company for its ultimate exit at a much higher valuation than a company that is not run that way. Is a dividend recap the right answer? We recognize that running the company like a PE firm would is not for everyone. That alone may be sufficient reason to sell even though the financial reward for the owner may be a lot less over time. And there are other life reasons that may force an outright sale now. Lastly, for technical reasons, a dividend recap may not be an option (the most usual reason is insufficient cash flow). But a business owner at least owes it to him or herself to look into the possibilities of a dividend recap before deciding to sell the company. We are happy to discuss these matters with business owners. Please send an email to schedule a thirty-minute phone call to find out. Stanton Associates is passionate about helping business owners unlock the value in their companies and keep it for themselves. We are different from most exit planners. Like others we help prepare the company for sale and guide business owners through the process. What sets us apart is our ability to drive significant value creation. It is our mission to ensure that business owners don’t allow to be stolen what is rightfully theirs. Members of the Stanton Associates team have been the CEO, CFO, COO, and Head of Sales at many mid-market companies. We know what it takes to drive value creation prior to an exit.